For the first time in many years, my husband, Dan, and I took the opportunity to get away for a long weekend -- just the two of us. This beautiful pencil sketch hanging above the fireplace in our room at Yelton Manor in South Haven, Michigan perfectly captured my plan for our weekend away -- relax! And that's exactly what we did. 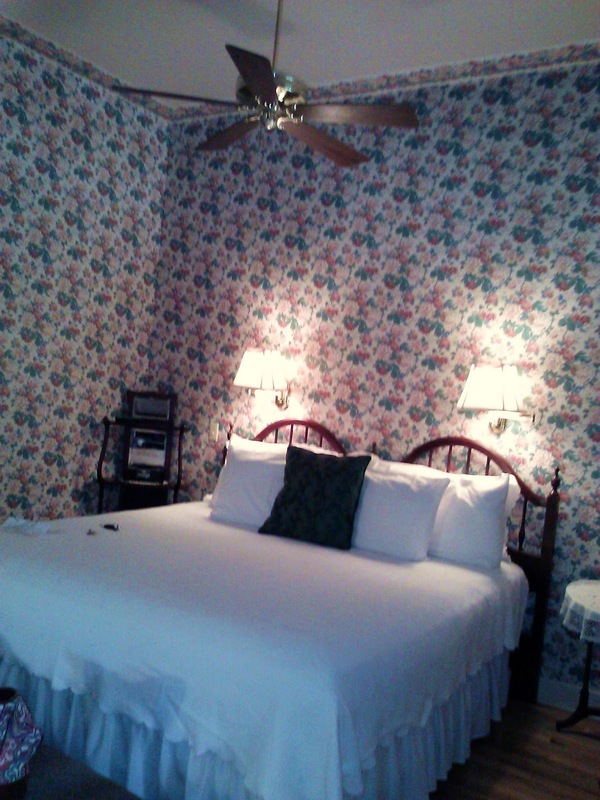 I loved this Bed and Breakfast! 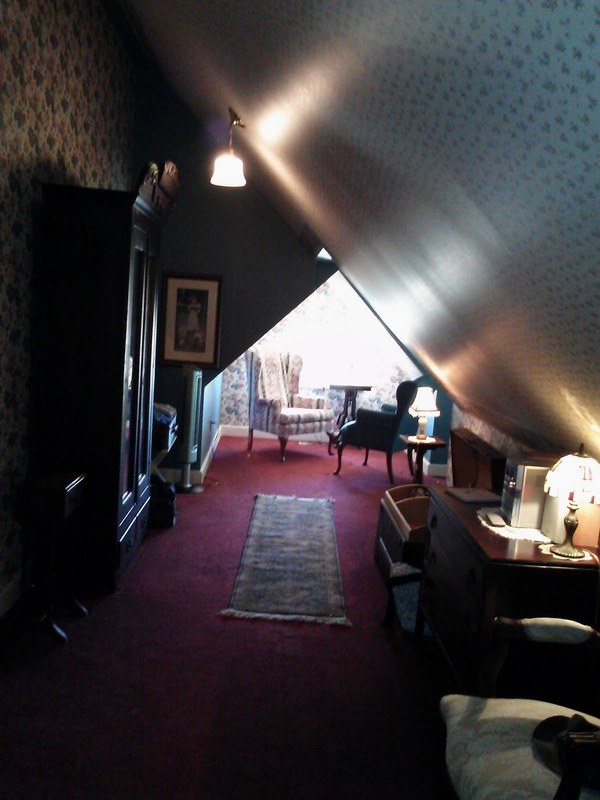 We stayed in a suite that occupied most of the third floor of The Guest House, one of the two buildings that make up Yelton Manor. The Dewey Suite is full of welcoming little alcoves, tall slanted ceilings, stained glass windows, wonderful antique furnishings, and coziness. We even had our own little balcony under the eaves. I quickly found a favorite spot to sit and crochet. And speaking of crochet, one thing that caught my eye was the large number of hand-crocheted doilies scattered about our room -- eight in all. Each was different and some looked like they were probably antiques. 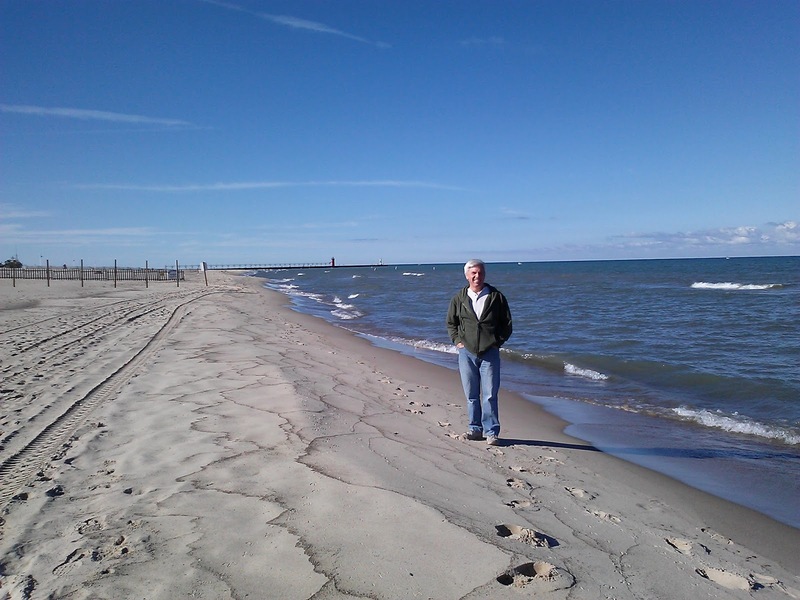 South Haven is located on the eastern shore of Lake Michigan, in southwestern Michigan. It sits right on the lakeshore, at the mouth of the Black River. Two piers jut out into the lake on either side of the river's mouth, and a bright red lighthouse graces the end of the southern pier. You can just make out the piers and the lighthouse in this photo I took of Dan on the beach near the Yelton Manor. Here is a view of the Black River, taken from the drawbridge in town. We had glorious, early autumn, sunny days during our stay, but when this photo was taken, on the morning we left to return home, it had started to rain. I have to say the weather pretty well capture my mood; I felt so sad to be leaving. And here is a picture of Captain Lou's, a great little bar and eatery that sits right on the river, where we had lunch on Saturday. It sits empty in the Sunday morning rain. The City of South Haven has many quaint and unique little shops. Two that I particularly enjoyed were Just Bead It, where I bought the lovely beads shown in the photo below, and Needles in a Haystack, a cozy little yarn store that carried gorgeous fibers. My husband and I lead very hectic, over-scheduled lives that often pull us in opposite directions. It was just so pleasant to have some time where we could relax and just be together. I couldn't help but notice the similarity between the words "haven" and "heaven". After "googling" the history of the two words, however, it seems that they don't even come from the same root word or have common origins. But I'm going to ignore the etymological research, because to me, our stay in South Haven was like a little taste of heaven.